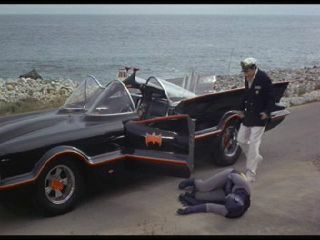 Batmobile (1966): This is easily the most famous superhero car of all movies and television, period. Who wouldn't want a Batmobile for his or her very own? 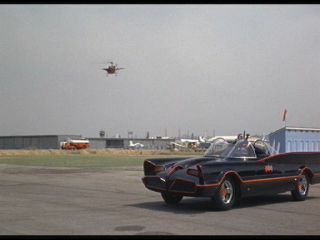 This version of the Batmobile, one of seemingly countless incarnations of the classic vehicle, appeared in the "Batman" TV series from 1966-1968, and the feature film "Batman" from 1966. Until recent years, the facts about this Batmobile were little known. Now, thanks to the release of the "Batman" film on DVD, and toy replicas of the Batmobile, we "non-super" people know a bit more about it. Legendary concept car designer George Barris is the father of the Batmobile. Or, at the very least, its adoptive father. You see, the Batmobile was built from a 1955 Lincoln Futura. It went through many adaptations, but in the mere three weeks Barris was given to create the car, it became the highly respected Batmobile we all know and love. It is currently on show at the Peterson Automotive Museum in Los Angeles, California, USA. Stats: Taken from package of Hot Wheels 1:64 scale replica, released in 2006.